Benjamin Rachinger, informant and part time undercover police operative, at least thats how many have referred to him, has indeed been a busy boy. Although, having said that, he seems to have gone remarkably quite since we exposed much of his story as a lie. 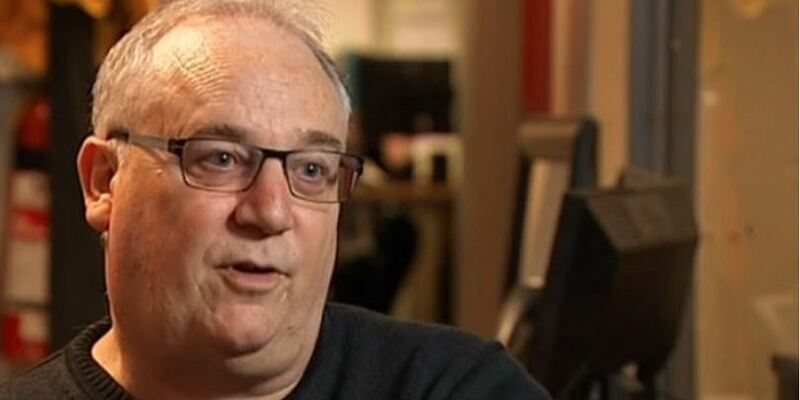 Most regular readers will be familiar with the antics of Rachinger, both as a result of his own on-line self-promotion, the many blog posts that have been produced over the past two – three years and of course the television items, courtesy of New Zealand’s TV3. As hard as Kiwi bloggers have tried none of the articles published really manage to get a handle on the illusive Mr Ben Rachinger, or for that matter two associates who lurked in the shadows. 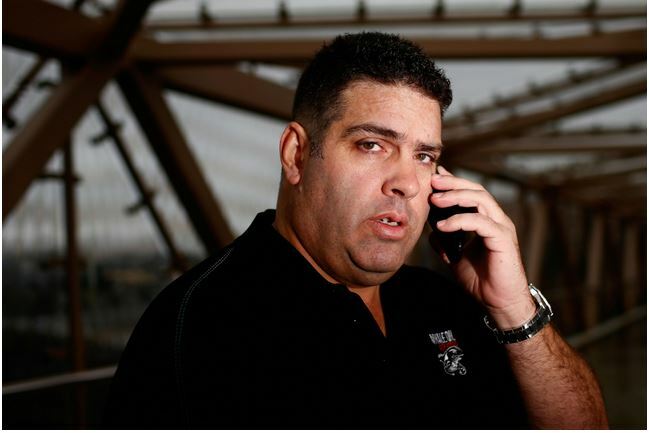 Rachinger himself has told many yarns about himself, ever shifting sand, tales of what drove him to befriend Cameron Slater, his efforts to take the blogger down and the scintillating claims of his haphazard involvement with New Zealand Police as a “Deep Cover Operative”. One Blogger however did come close to nailing down the real story, but not quite. Suzy Dawson penned an investigative piece, published in 2015 which seems to have gone largely unnoticed. Despite Ms Dawson’s inability to nail down Rachingers real agenda, which is completely excusable, she did in fact quickly hone in on his police handler, DS Mike Hayward, and the hours in which the pair were communicating, and on occasion, meeting; sometimes late into the evening, at times when it was Slater was known to be busy with his blog. Expending precious writing time on yet another self-admitted police spy infiltrator hasn’t been a high priority. Just scratching the surface of the colossal Ben Rachinger Hoax led to an article framework of 22 sub-topics that would have taken 6000+ words to elaborate on. But it doesn’t take 6,000 words to see the Ben Rachinger Hoax for what it is. All it takes in fact, is the tiniest bit of further investigation into his own claims as posted in his (for want of a better term) online manifesto. Rachinger’s own words are more damning than anything a critic could ever write. We here at LF in our very first post on Rachinger’s story, noted something that absolutely no one else then or since has managed, nor wanted to explain. Just why was it that Rachinger had set about attempting to engage Lauda Finem using twitter, when he was in the throws of getting to know Kiwi mega blogger Cameron Slater. As regular readers will recall LF also pointed out in our first assessment of Rachinger that he had, in these tweets also attempted to entrap LF members into unwittingly committing an act that could well have been used by the New Zealand police to lay a criminal information. Of course we were aware of Dentith’s past involvement with the media, the New Zealand police and various corrupt individuals, as we were the timing often associated with these “cameo’ appearances, so at the time paid it little attention to the theories Dentith attempted to ram down the throats of a gullible public, we saw them as little more than a smokescreen; and were right to do so. The only blogger who ultimately saw through much of the speculation, in particular Dentith’s assessments, completely ignoring them herself, when investigating, was Suzy Dawson, Dentith’s blog posts didn’t even rate a mention. Rachinger’s story had contained one glaringly obvious hole from the very outset; particularly as in it related to his attempts to publicly explain away his involvement with the New Zealand police, Suzy Dawson also saw straight through the glaring anomalies and absence of plausibility. Rachinger claimed that he had been asked by police to monitor Slater and his associates, purportedly so as to assist police with their hunt for the by now infamous Rawshark. This claim just did not stack up on any level, most importantly in that police would certainly have nothing to gain using by Rachinger for such an operation. Rawshark had completed his or her mission, doubtless they would not be hanging around online for a curtain call. This then lead us here at LF to exclude these explanations, given, as aforesaid, their implausibility. We did however not exclude the possibility that Rachinger had a very close relationship with the police, in fact that possibility had always been on our radar. 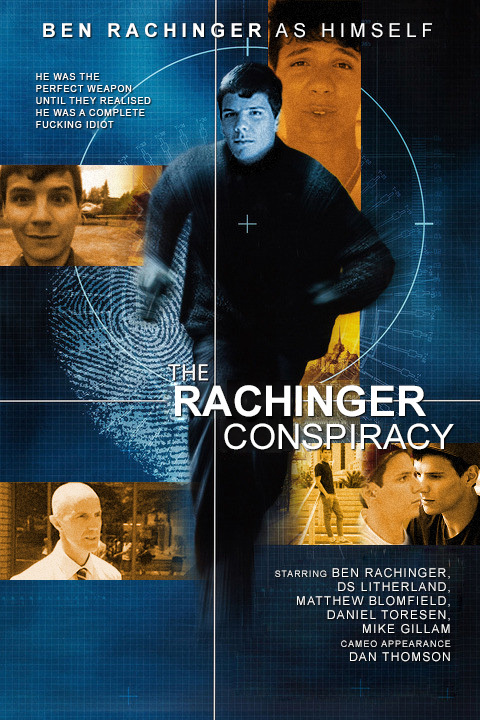 At a much later point, when Rachinger had gone completely off the rails, we managed to obtain not only the name of the police officers Rachinger had dealt with, but copies of his statements to police. 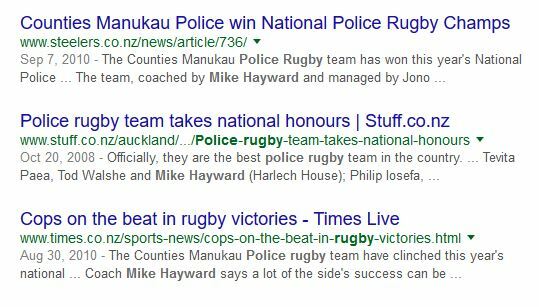 Those statements, along with various other pieces of evidence we have now collected, point to a far more involved and sinister relationship between Rachinger and two senior police officers; in particular a Detective Senior Sergeant Mike Hayward and one Detective Sergeant Peter Litherland, both of whom are Rugby Coaches and both, in equal measure, heavily involved in the politics of the game. 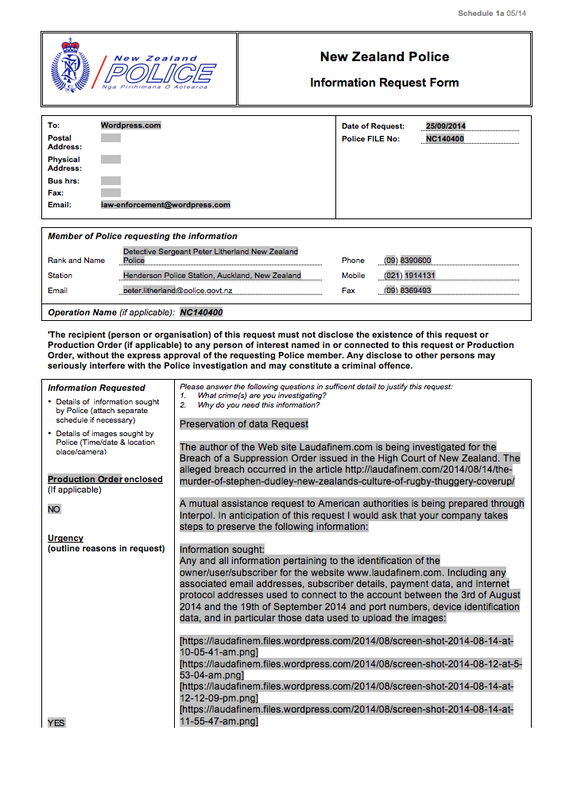 We have now managed to determine that Rachinger,s involvement with the New Zealand police had very likely commenced long before he had in fact first contacted Cameron Slater. Whats more, that neither Slater nor Rawshark were in fact the target of Rachinger’s police assignment. As said LF have now placed Rachinger working with police long before he approached Slater under the guise of a young man interested in politics, National party politics. Suzy Dawson likewise has also place Rachinger working for police, in particular, cops that operate out of Harlech House, 48 Great South Rd, Otahuhu, Auckland, New Zealand. This is also the Otahuhu address that that Rachingers so called “minder”, Detective Sergeant Hayward, has operated from for a number of years. 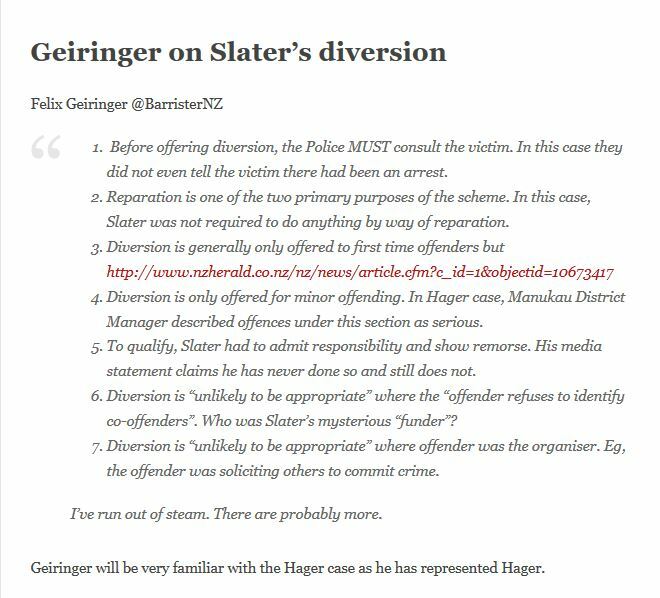 We have also managed to determine that even the videos Rachinger had sent to Slater were very much part of an elaborate ruse designed by police officers and Rachinger to pander to Slater’s political interests, an attempt to ingratiate himself and obtain the bloggers trust. 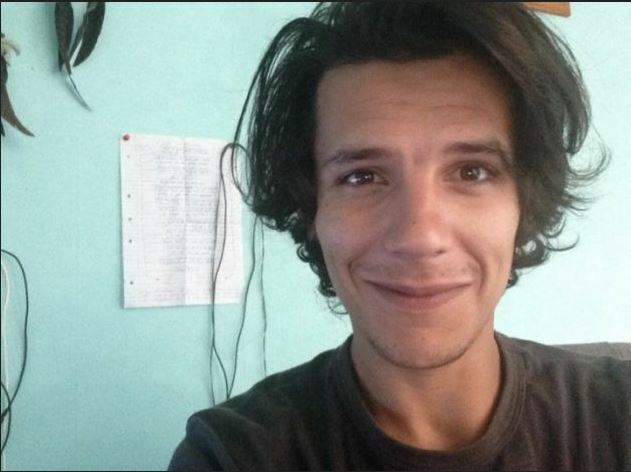 The sole purpose of this police operation, using Rachinger, was an attempt to establish the identities of those behind Lauda Finem, a flawed attempt to prove a more than deranged theory that the LF website was being run from within New Zealand. Police clearly at the time believed that they had good reason to suspect that Slater would have known the identities of LF, despite our public staements to the contrary, since our team had been working hard assisting Cameron’s Slater and his sources in the Matthew Blomfield defamation case. Moreover, Police could not expect Slater, a journalist, to simply hand over confidential source type details over to police. Cleary Police had failed miserably with their Bull in a China shop approach in the Nicky Hager matter. 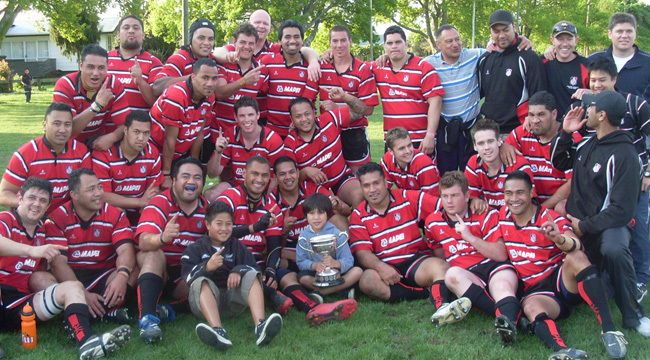 These particular police officers were desperate to prevent team LF from further exposing the truth behind what had occurred in the investigation and coverup in the death of Auckland school boy Stephen Dudley; at the hands of a much older fellow rugby player. The officers in question are again, one DS Mike Hayward @ DS Peter Litherland, bot Rugby coaches, one having also been responsible for overseeing the attempted burial of the Stephen Dudley case; halting the prosecution of the two perpetrators. In particular the New Zealand police were and remain seriously concerned at the fact that the truth would be exposed. The truth being that the killer had, prior to police dropping Murder and manslaughter charges, replacing those informations with common assault, both perpetrators then pleading guilty (a requirement for the police scam to work). That these arrangement were set in place after the elder of the pair had obtained an offer to play rugby for Japanese Rugby team in Osaka, and that this offer to play in Japan, a pending contract, was instrumental in police deliberately fudging the investigation into Stephen Dudley’s killing and organizing for the killer and his younger brother to walk away from the crime scott-free. All of this quite obvious corruption to facilitate an escape from conviction, just so yet another Kiwi rugby “Star Player” and potential “All-Black” could continue to obtain the required visas and travel as was required to advance and save his Rugby career. Rachinger’s handler Rugby coach Detective Sergeant Mike Hayward refers to not to a warrant, but “Warrants”, more than one. Hager was not in fact Hayward and Litherland’s primary target. Rachinger had passed on false information about two individuals. 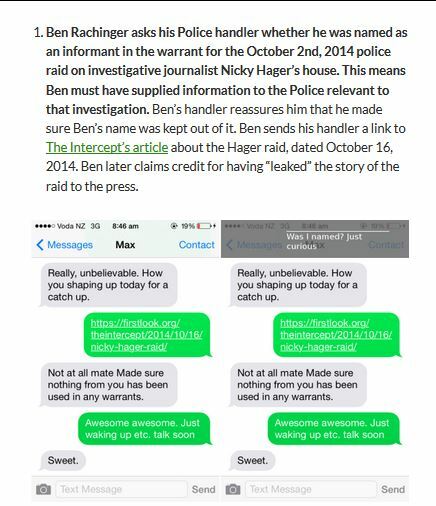 We also now know that when Rachinger was texting Slater, using the so-called Threema app, that DS Mike Hayward was very likely on occasion in the same room, at his side, or communicating with him; and that the purpose of these texts was entrapment, to entice Cameron Slater to commit a series of criminal offenses, (conspiracies), which police knew they could then use to manipulate Slater into divulging what he knew about LF. Unfortunately for police, and arguably fortunately for Slater, he genuinely knew nothing. Team Lauda Finem trust no one; we know what New Zealand society is like, it’s small, it’s extremely corrupt and the country has a police force who operate pretty much like the East German Stasi during the communist era; in that certain elements have developed and fostered a network of loyal informants and operatives. The other major error police clearly made was letting Rachinger in on the methods police were employing against Slater; a failure that would come back to haunt them when Rachinger later began drinking heavily, eventually turning rogue on police. Now despite what many Kiwi’s may think of Slater, we here at LF, as yet, have no solid evidence that he was in any way a party to this skulduggery, at least in the initial stages, before police interviewed him in relation to the trumped up charges police laid against him; we suspect to appease the so called victim, Lynn Prentice and Labour party website The Standard. In fact, the way police and New Zealand crown prosecutors eventually dealt with the criminal information’s they were forced to lay against Slater suggests that police had been well and truly fucked by Rachinger’s very public antics. Saved only by the a drunken Rachinger’s reluctance to tell the whole truth; we suspect a measure of self protection on the part of Rachinger. There is no doubt Rachinger knew that he had something to work with, that he and Hayward had been successful in entrapping Slater with the potential conspiring or soliciting a crime offense, that charges could be laid by police, because DS Mike Hayward had no doubt told him that much; Hayward being Rachingers “police minder”; always in his ear instructing him on what to do and say, and when to say it. We also believe that DS Hayward was likely sitting with Rachinger when he tweeted LF, on that occasions also proposing that an offense be committed; another attempt to entrap, an effort that, unlike their scam on Slater, failed miserably. Now of course whilst these plans remained covert, being between Rachinger and his so-called police minders, DS Mike Hayward & DS Peter Litherland, they were relatively harmless and could be employed by these two cops to obtain information from Slater, no doubt under threat of prosecution. Once Rachinger had gone public however, undoubtedly whilst under the influence of alcohol and mental ill-health, the police had lost any control they might once have been able to exert over him. 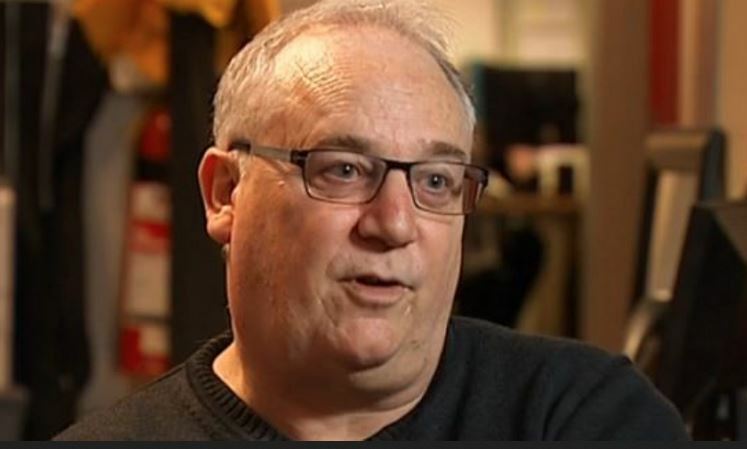 What’s more, when Rachinger decided to go to the media, egged on by a handful of naive but supportive journo’s, left-wing bloggers and a politically active Twitteratti, the police officers involved were in very real peril of being exposed. Rachinger’s invitations for Lynn Prentice to lay a complaint with police, that he was willing to support, really threw the cat in among the pigeons and had the cops, in particular DS Mike Hayward panicking, so much so that during Rachingers interviews DS Mike Harward was listening from an adjoining room. Once a complaint had been made police had absolutely no choice but to investigate it and follow through with charging Slater, all the while both Hayward and Litherland skulking around in the shadows, a very nasty mess indeed, but one of the police’s own making. Police dealt with it as they normally do, they lied and manipulated legal procedure and another District Court Judge to slip Slater out the back door, off without so much as a criminal record, for the alleged offending. This of course satisfied the less educated but curious public and Slater’s blog supporters who had been watching on. It did not however satisfy those who hated Slater, namely the purported victim of the hack Slater was alleged to have solicited. 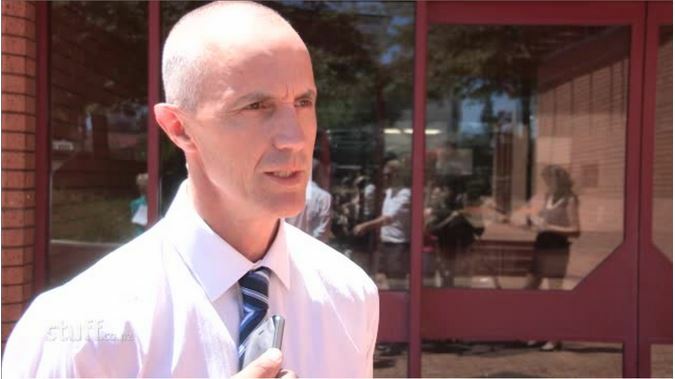 Fellow blogger Lynn Prentice was furious, as was the lawyer who had been representing Nicky Hager, another of the victims of the polices subversive efforts, aided by Rachinger. That Lawyer, Felix Geiringer, was quite taken back by the fact that Slater had walked away scott-free Geiringer did in fact have good reason to be concerned, as the police had somehow managed to break every condition in the book to get Slater diversion. But the fact is they knew he wasn’t really guilty and the Police could be exposed should it actually go to trial. The reality is Police would never have been able to get a conviction against Slater based on Rachinger’s evidence alone, and there was no way they were about to admit any police involvement, which Rachinger had originally wanted; certainly DS Hayward wasn’t about to get up and give evidence at a trial. In the end the police responsible did not get the result they wanted; they were in fact no closer to finding out who laudafinem is. Of course Rachinger disappeared and has not resurfaced since LF published our last story on his relationship with DS Hayward. Strangely enough all mention of Rachingers trial has also dried up in the New Zealand media, almost as if it had never transpired. Starnge given that it was such a big story in the eyes of the local MSM. This is of course quite typical, indicating New Zealand police involvement, police may well now have done a deal to buy Ratchinger’s silence. The Police failure, with the assistance of Rachinger, will not stopped them however. DS Litherland and his police associates have in the past employed various another covert scams in their efforts to establish who is behind LF. A prior stunt pulled by Litherland was when he contacted LF’s previous web host WordPress; that stunt also having failed. Now given that team LF are not subject to New Zealand jurisdiction, all being based well away from the short fat corrupt arms of New Zealand’s police and it,s thoroughly malleable courts, it will indeed be interesting to see what stunt they come up with next. It seems that New Zealand’s police will stop at nothing to prevent their malevolent and criminal behavior being exposed.